In two-dimensional geometry, a parallelogram is a quadrilateral (a four-sided figure) with two pairs of congruent sides and two pairs of congruent angles. The following practice questions ask you to use the properties of parallelograms to find missing angles and variables. 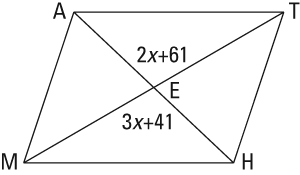 intersect at E. Use the figure and the given information to solve the following questions. If AT = 2a + 3b, MH = 28, AM = 4a + b, and TH = 26, find the sum of a + b. Therefore, a + b = 5 + 6 = 11.